We’d love your help. 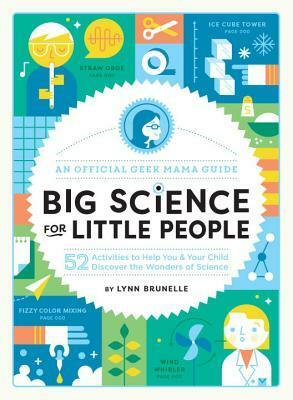 Let us know what’s wrong with this preview of Big Science for Little People by Lynn Brunelle. Introduce future engineers, inventors, naturalists, and artists to the physics and chemistry, biology and ecology behind everyday play. Create chemical reactions, explore gravity and friction, transf Make your child's first forays into science fun! 52 clever and easy experiments for things that will zip, zoom, and fly, and fizz, bubble, and burst. For children ages 4 to 8. To ask other readers questions about Big Science for Little People, please sign up. What a fantastic, hands-on, science book for children. There are 52 activities to have fun with in this small nonfiction book. I wasn’t expected such a small book but it’s perfect for small hands. There are many activities inside this book that I am excited to attempt. From the Exploding Lunch Bag, Magic Milk, to the Garden Hose Tuba. I found some activities that I have successfully attempted in the past and I found some activities that just didn’t interest me. I was glad that it had such a vari What a fantastic, hands-on, science book for children. There are 52 activities to have fun with in this small nonfiction book. I wasn’t expected such a small book but it’s perfect for small hands. There are many activities inside this book that I am excited to attempt. From the Exploding Lunch Bag, Magic Milk, to the Garden Hose Tuba. I found some activities that I have successfully attempted in the past and I found some activities that just didn’t interest me. I was glad that it had such a variety of activities for children. Most of the activities covered two pages but a few of them were a couple pages more. Most of the items that you need for the experiments are not complicated items but things that you might have around the house. The author informs the reader the science behind the experiment and they also provide information should they want to expand on the experiment. The book is broken down into things to do inside the house and things to do outside. I think this book is great. I think you could tailor this book for younger children and also expand it for older elementary children. Thank you Murder by Death for bringing this book to my attention. This was a gift. Really good! We done a few so far and it's really good at explaining the scientific theory in a way my 5 year old can understand. Full of wonderful science experiments that can be done with items and ingredients found in most homes. The experiments vary from making a vinegar and baking soda explosion and growing mold on bread, to creating a contained rainstorm and growing geodes inside eggs. This is a must have for any parent! The projects are fun and educational, and create interest in and excitement about science at a young age. All of the ingredients called for are easy to find at home or a typical grocery store. There Full of wonderful science experiments that can be done with items and ingredients found in most homes. The experiments vary from making a vinegar and baking soda explosion and growing mold on bread, to creating a contained rainstorm and growing geodes inside eggs. This is a must have for any parent! The projects are fun and educational, and create interest in and excitement about science at a young age. All of the ingredients called for are easy to find at home or a typical grocery store. There are even a few that I want to do for my friends. The only con is that the book used only one color to compliment the black and white text. A more colorful book would be more appealing, or possibly one that had photos of the experiments being done and ingredients needed.. As this is an eARC, I am not sure if it will be a bit different when published. Great experiments, explanations, and book layout! Lack of color photos make this books less interesting than it could have been.